March is National Women's History Month, presenting another opportunity to honor women who have shaped America's history and its future. 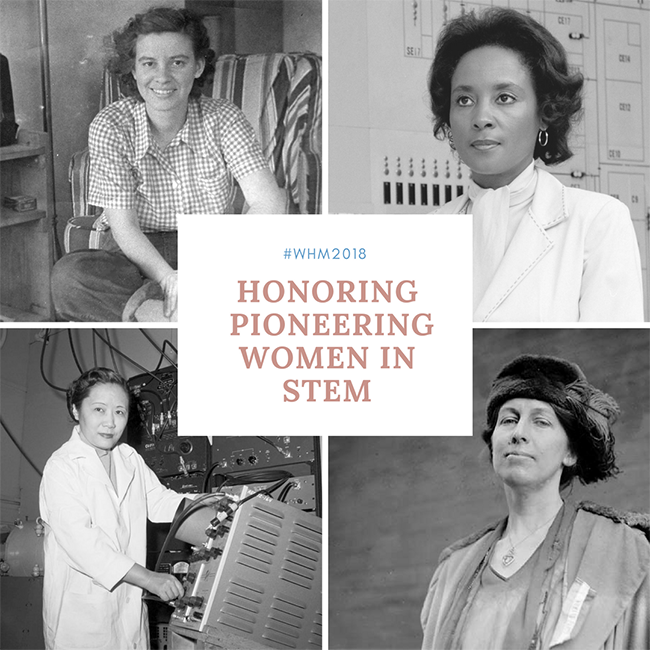 The Office of Equity Diversity and Inclusion (EDI) is proud to honor pioneering women in STEM (science, technology, engingeering, mathematics) who impacted society through their groundbreaking work and accomplishments, notwithstanding the discriminatory and societal constraints that existed then and now. These exceptional women have open the doors for many and have made an impact in history. Stanton Barney was among the first women in the United States to earn a civil engineering degree, graduating from Cornell University in 1905. While studying at Cornell she had founded a suffrage club, and from 1909 to 1917 she campaigned heavily for the cause in New York. She was also the first woman to earn Junior Member status in American Society of Civil Engineers (ASCE). In 1916, Stanton Barney sought to become the first woman to enjoy full ASCE Associate member status, but the Board of Direction turned down her application. She challenged the decision in court, but a New York state Supreme Court upheld ASCE. She went on to an illustrious career but did so without having been accorded membership in ASCE, for which she clearly was deserving. That status changed this August 2015. The ASCE Executive Committee voted Aug. 11 to posthumously advance Nora Stanton Barney to the status of ASCE Fellow. "We want to recognize and appreciate those who have paved the way for today and tomorrow's diverse leadership for ASCE and the engineering profession," said Executive Director Thomas W. Smith III, ENV SP, CAE, F.ASCE. "Advancing her to the higher level of ASCE Fellow recognizes her significant contributions." In addition to her work in civil engineering, Barney devoted her time to the woman suffrage movement. She became the president of the Women's Political Union in 1915, succeeding her mother, and edited the organization's Women's Political World. She subsequently participated in the efforts of the National Woman's Party for a federal Equal Rights Amendment. Annie Jump Cannon studied physics and astronomy at Wellesley College and went on to work at Harvard Observatory. A trailblazer for women in science, she discovered hundreds of variable stars and devised a unique system of classification that became the universal standard, in which she listed hundreds of thousands of stars. Cannon was known for her diligence and skill in addition to her enthusiasm and patience. She classified more than 225,000 stars, and her work was published in the Henry Draper Catalogue over the course of nine volumes between 1881 and 1924. In 1911, Cannon became the curator of astronomical photographs at Harvard Observatory. She worked at astounding efficiency and was able to classify up to three stars a minute. In the 1920s, Cannon cataloged several hundred thousand stars to the 11th magnitude. She discovered 300 variable stars, in addition to 5 novae, a class of exploding stars. Cannon and the other women at the observatory were criticized at first for being "out of their place" and not being housewives. Women did not commonly rise beyond the level of assistant in this line of work at the time and many were paid only 25 cents an hour to work seven hours a day, six days a week, Cannon dominated this field because of her "tidiness" and patience for the tedious work, and even helped the men in the observatory gain popularity. Cannon helped broker partnerships and exchanges of equipment between men in the international community and assumed an ambassador-like role outside of it. She wrote books and articles to increase astronomy's status, and in 1933, she represented professional women at the World's Fair in Chicago. In 1955, Easley began her career as a "human computer," doing computations for researchers. This involved analyzing problems and doing calculations by hand. Her earliest work involved running simulations for the newly planned Plum Brook Reactor Facility. When hired, she was one of only four African-American employees at the Lab. In a 2001 interview, she said that she had never set out to be a pioneer. "I just have my own attitude. I'm out here to get the job done, and I knew I had the ability to do it, and that's where my focus was." Even in the face of discrimination, she persevered. "My head is not in the sand. But my thing is, if I can't work with you, I will work around you. I was not about to be [so] discouraged that I'd walk away. That may be a solution for some people, but it's not mine." When human computers were replaced by machines, Easley evolved along with the technology. She became an adept computer programmer, using languages like the Formula Translating System (Fortran) and the Simple Object Access Protocol (SOAP) to support a number of NASA's programs. She developed and implemented code used in researching energy-conversion systems, analyzing alternative power technology-including the battery technology that was used for early hybrid vehicles, as well as for the Centaur upper-stage rocket. Easley began a career that would span 34 years. She would contribute to numerous programs as a computer scientist, inspire many through her enthusiastic participation in outreach programs, break down barriers for women and people of color in science, technology, engineering, and mathematics (STEM) fields, and win the admiration and respect of her coworkers. In 1944, Esther was hired as a research assistant to the geneticists George W. Beadle and Edward Tatum at Stanford University. Her work with them greatly assisted their winning of the Nobel Prize in 1958 for discovering the role of genes in regulating biochemical events in cells. Three years later she joined her husband at the University of Wisconsin as his unpaid research associate. Together they launched experiments to investigate the way bacteria manage to adapt and become resistant to a drug to which they were previously allergic. In aiming to understand how chromosomes behave, they demonstrated for the first time that mutant changes occur so rapidly in bacteria that the process could be tracked in the laboratory. Although Esther was recognized as outstanding in the laboratory both experimentally and methodologically, she struggled to get a permanent academic position. In part, this reflected the wider discrimination against female scientists at the time. She had the further challenge of being married to and collaborating with Joshua who, by virtue of being a man tended to attract greater public attention. Esther's modest nature also did not help. In 1953, when Joshua accepted an award from Eli Lilly and pointed out that she too should have been given it because she had played a pivotal part in his work, she characteristically downplayed her significance, arguing 'there are six or eight people in the background every time someone gets an award'. When Joshua moved to Stanford University as head of genetics, in 1959, Esther was appointed as an untenured research associate professor in the department of microbiology and immunology. This happened after she and two other women petitioned the dean of Stanford University's Medical School over the lack of women professors on its faculty. Her appointment was made on the basis that she was willing to accept an untenured post. She was, in fact, overqualified for the position. Esther's first major achievement was her discovery of the lambda phage when completing her doctorate in 1950. She spotted it when she observed irregular patterns in a culture with different colonies of the bacteria Escherichia coli K-12 (E-coli), including a strain that had been irradiated with an ultraviolet light called W-518. What she noticed was that some of the colonies appeared to be missing some segments. Further investigation revealed that this was due to a latent virus in the E-coli K-12 which had become active in the mutant W-519 strain and was preventing its growth. Today the lambda phage is a key tool in molecular biology. In part, this is because it can be grown easily in E-coli and it is not pathogenic except in the case of bacteria. It has proven particularly helpful in understanding the transfer of genetic material between bacteria, the mechanisms involved in gene regulation and how pieces of DNA break apart and recombine to make new genes. It also serves as a model to study other viruses with similar behavior, such as the herpes virus and is also used as a marker of molecular weights. The phage is also an important tool for genetic engineering. Researchers are also exploring its use in the clinic, deploying the phage to treat bacterial infections. Known as phage therapy, which was first developed in the 1920s, this type of treatment is gaining increasing attention as a possible alternative to antibiotics. Nuclear physicist Chien-Shiung Wu, also known as "the First Lady of Physics," contributed to the Manhattan Project and made history with an experiment that disproved the hypothetical law of conservation of parity. After the leaving Manhattan Project in 1945, Wu spent the rest of her career in the Department of Physics at Columbia as the undisputed leading experimentalist in beta decay and weak interaction physics. After being approached by two male theoretical physicists, Tsung-Dao Lee and Chen Ning Yang, Wu's experiments using cobalt-60, a radioactive form of the cobalt metal disproved the law of parity (the quantum mechanics law that held that two physical systems, such as atoms, are mirror images that behave in identical ways). Unfortunately, although this led to a Nobel Prize for Yang and Lee in 1957, Wu was excluded, as were many other female scientists during this time. Wu was aware of gender-based injustice and at an MIT symposium in October of 1964, she stated: "I wonder whether the tiny atoms and nuclei, or the mathematical symbols, or the DNA molecules have any preference for either masculine or feminine treatment." She campaigned for gender equality in her profession and beyond, correcting anyone who called her by her husband's name and insisting on being paid the same as her male colleagues at Columbia. Having overturned the theory of parity in physics, she was determined to uphold it in society. In addition to these remarkable women, NIH employed women in the laboratory starting in the 1930s. Contributions to science and research displayed far-reaching advances made, view pictures and learn more about these pioneering women.